Flaxseed flour, or ground flaxseed, enhances the nutrition profile of baked goods by adding fiber, Omega-3 fatty acids and lignans. Flaxseed flour is a white powder made from grinding flaxseed. Flax has been cultivated for thousands of years. Currently Canada is the largest producer of flax, followed by the United States, China, and India. Enhance the nutrition profile of baked goods by adding fiber, Omega-3 fatty acids and lignans. 7.7% moisture and 3.4% ash. For bread, pizza dough, and muffins substitute up to 25% of flour weight with flaxseed flour. High in fat, protein, and dietary fiber. Gluten free. 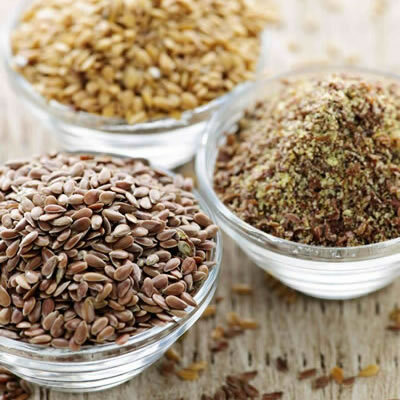 Omega-3 fatty acids in flax reduce cholesterol and provide protection against heart disease. How does it compare carbohydrate wise to other Gluten Free flours? What are some manufacturers who sell flax flour? An analysis of brown Canadian flax averaged 41% fat, 20% protein, 28% total dietary fiber, 7.7% moisture and 3.4% ash. Dr. Carson’s advice is not to use too much flax because it can make your product rancid fast.